Why Choose Pennsylvania for Online Higher Education? By 2020, analysts project that 63% of in-state jobs will require postsecondary education in Pennsylvania, and 22% of jobs will require at least a bachelor’s degree. These growing demands led state institutions to establish initiatives to educate more students in Pennsylvania and attract more educated professionals from around the world. Between 2012 and 2016, nearly 30% of Pennsylvanians over the age of 25 secured a bachelor’s degree or higher. 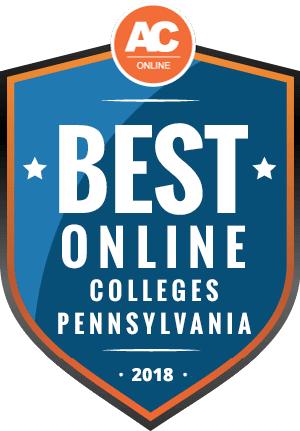 To help you choose an online program that is right for you, we’ve created a list of online colleges in Pennsylvania ranked by affordability and quality, and provided information on start dates, financial aid, and transfer credits. To help meet the economic demands of educated professionals and the educational demand for accessible programs, the online college landscape in Pennsylvania is expanding and improving. While Pennsylvania’s in-state tuition exceeds the national average, increased access to online degrees in Pennsylvania bodes well for students in the state, particularly those working full-time. Furthermore, initiatives to improve educational pathways for economically disadvantaged students, like single parents and underserved populations, should improve opportunities for those who need them most. Many institutions in Pennsylvania offer reduced tuition rates for in-state residents. Average in-state tuition of $13,416 is substantially less than the average out-of-state four-year tuition of $25,367. Two-year institutions in Pennsylvania charge an average tuition of $4,791 for in-state applicants and $11,801 for out-of-state applicants. In Pennsylvania, many institutions offer the same tuition rates for all students, regardless of location. The same tuition enables students from all over the world to attend online college programs in Pennsylvania without the need to relocate or pay substantially higher fees. Moreover, some online universities in Pennsylvania honor reciprocity agreements with neighboring states, giving students access to reduced or in-state tuition prices. Compared to the national average for four-year tuition fees, Pennsylvania institutions charge approximately 54% higher tuition fees for in-state students. The state’s out-of-state tuition fees, however, are only 5% more than the national average. The differences in cost per credit between two-year colleges, public universities, and private universities can prove substantial. Below you’ll find examples of tuition costs students should expect to find in Pennsylvania from different higher learning institutions. When searching for online colleges in Pennsylvania, out-of-state students should consider the number of students studying exclusively online in the state. Students should also explore any reciprocity agreements their chosen schools offer. Out-of-state students must verify that the school of their choice does not hold any state restrictions or unmanageable residency requirements. While some online schools in Pennsylvania may offer tuition breaks for students from specific states, the state itself does not offer a reciprocity agreement for residents of other states. Since Pennsylvania represents one of the few states not connected to a regional interstate compact, students wishing to receive in-state tuition rates while studying on-campus in Pennsylvania must prove residency. Pennsylvania may not offer out-of-state tuition discounts for on-campus students, but out-of-state students attending an online school in Pennsylvania can benefit from an online reciprocity agreement. Established by the National Council for State Authorization Reciprocity Agreements, NC-SARA enhances the quality of online instruction and access to online programs. It also reduces costs associated with distance learning. Additionally, many Pennsylvania institutions offer reduced tuition rates for out-of-state online students because of the lower overhead and material costs associated with distance learning. Below is a list of the best accredited online colleges in Pennsylvania. Each school is ranked based on metrics including average tuition price, graduation rates, availability of student services, and breadth of online programs. These metrics highlight the most affordable online colleges in Pennsylvania with the highest quality programs, services, and faculty. Read on to discover the right program for you. Anyone interested in attending a Catholic university may find their community at Cairn University. At this college,there are six schools of education: Business, Divinity, Education, Liberal Arts & Sciences, Music, and Social Work. Students can earn a master's degree while they also earn their undergraduate degree through Cairn's dual-level degree program, which will allow them to graduate with a higher-level degree in as few as five years. There is an emphasis on the biblical perspective in all undergraduate majors, and graduate students study the Bible and theology in addition to pursuing their professional development. For students who want to complete a degree in Bible studies, Christian ministry, counseling, or liberal studies, there are degree completion programs for these specific fields. Students looking to earn online degrees in Pennsylvania can enroll in Cairn's online graduate and degree-completion programs, which also provide a strong emphasis on Catholic values. At Cairn, on-campus and online students alike will learn to apply their beliefs to everyday life, their education, and their careers. Temple University is a great choice for students seeking undergraduate, graduate, or professional degrees in Pennsylvania, and students who are interested in exploring international education opportunities. With 17 schools and colleges across seven different campuses located in Philadelphia and Harrisburg, Rome, and Tokyo, students can find their place within the larger Temple student body. Temple also offers online, distance, and blended courses for students seeking to earn a graduate degree through online colleges in Pennsylvania. Accelerated degree programs allow students to earn both a bachelor's and advanced degree in a shorter amount of time—between five and seven years, depending on the program. Several of Temple's colleges offer dual degrees as well, which have a deeper focus on aspects of law, medicine, theater and media, public health, and business. Adult learners and professional development-seekers are also welcome to take continuing education courses at Temple. Previously known as the Baptist Bible College and Seminary of Pennsylvania, Clarks Summit University is a Baptist college for undergraduate, graduate, and seminary students in Northeastern Pennsylvania. Clarks Summit offers online and on-campus programs that focus on ministries, Bible and theology studies, and counseling, in addition to traditional majors like business and literature. Students seeking online degree programs in Pennsylvania with a curriculum based in the Bible will find that Clarks Summit offers associate's, bachelor's, or master's degree programs through distance learning. There are also a range of study abroad experiences to explore through this university. Students can develop an understanding of other cultures while exploring different ministries around the world in places like Germany, South Africa, Italy, and Peru. Ten percent of students at Clarks Summit come from homeschool backgrounds, and the college works to create a community environment that supports these students. Undergraduate students live on-campus in one of seven residence halls, sharing a three-bedroom suite with up to five other students. Graduate and seminary students can also stay in dorms on-campus or visit campus dorms during the course of their studies. Located in Pittsburgh, Pennsylvania, La Roche College is a private, Catholic institution that offers over 50 majors in the fields of education and nursing, management, natural and behavioral sciences, the humanities, and design. The design program at La Roche provides internship opportunities and potential minors in visual communications or sustainable interdisciplinary studies, which provide deeper attention to creative problem solving and environmental concerns. Ministry opportunities at this college focus on service to Pennsylvania communities as well as global service, and there is a strong international studies program committed to peace and justice. Students seeking to complete degrees through online colleges in Pennsylvania will find that La Roche offers several business, nursing, and criminal justice degree completion programs for remote learners. There are also individual courses available online for students who would like to combine on-campus classwork with online learning. On-campus students may live in the apartment-style dorms, or commute from the nearby area. While Wilson College offers a range of undergraduate majors, they have specialized programs for students interested in working with horses. They have several equine-based courses of study, including Equine Facilitated Therapeutics, which also reflects Wilson's emphasis on educational training. Students in this major learn therapy techniques that use horses, encouraging physical improvement and emotional development in people with special needs. Graduate students can choose to earn a master's in business, education, the arts and humanities, or nursing. Adult learners are welcome to enroll in any of Wilson's programs, including adult learners who wish to earn a degree through online colleges in Pennsylvania; there are hybrid programs available as well as entirely online degree programs. Wilson offers a Masters of Education online and several online nursing programs. Students who choose to attend classes on-campus exclusively will live on-campus for all four years in several different housing options: with roommates, in a single, or in a suite-style dorm. The University of Valley Forge is a private Christian and interdenominational college that offers undergraduate, graduate, and associate degrees in the arts, sciences, and various professions, including ministry leadership and theology. The are accelerated online programs for both undergraduate and graduate degrees, which work well for students looking to attend online colleges in Pennsylvania and quickly earn their degree. There are also traditional degree programs available online for students. All Valley Forge students, whether they take classes online or in-person, complete the equivalent of a dual degree program; Biblical World View is a required course of study, and then students choose from over 50 other majors. The college has a very strong Department of Intercultural Studies program, including courses for Deaf students and students who wish to minster in the Deaf community. High school juniors and seniors can also take college courses online for credit through Valley Forge's Dual Enrollment program, getting a jump-start on college credits. This can save students a lot of money, whether they choose to attend Valley Forge for their undergraduate degree or attend a different college with these early credits out of the way. The second-largest city in Pennsylvania hosts the main campus of University of Pittsburgh, which offers over 100 different undergraduate majors. Students can earn a degree in the liberal arts, a professional degree program, STEM fields, medicine, or take one of 20 distance learning courses that allow students to earn a certificate or degree from a nationally ranked online college in Pennsylvania. Most of the University of Pittsburgh's online courses are graduate certificates or graduate degrees, but the college's school of nursing also offers both undergraduate and doctoral degree programs to online students. High school students and graduate students who have clear professional goals can apply for the University of Pittsburgh's Guaranteed Admissions program, which ensures students are admitted to the specific program that will help them achieve their intended career path. The college also offers personal growth and development experiences to on-campus students through the Outside the Classroom Curriculum. This curriculum incorporates classes, experiences, and self-reflection to help students gain skills to prepare them for employment or graduate school. At Peirce College, students can earn an undergraduate or master's degree in business, healthcare, legal studies, or technology. Peirce values students' life experiences and previous educational milestones, offering transfer credits for passing exams, previous certifications or credits, and military and work experience. Adult learners who want to earn their degree faster can also enroll in an intensive program that allows students to take additional course credit during weekends, the college's winter break, or through an online class. Students can earn online degrees in Pennsylvania through Pierce's online learning programs, which have the same level of high-quality instruction as their on-campus programs. Because Peirce's degree programs are structured in the same ways, students can earn their degree online, on-campus in Philadelphia, or in a hybrid program. Peirce also offers competency-based education, which is self-paced and fully online. This program is ideal for students with previous experience who only want to learn and pay for what they need to know to progress and earn a degree in their field. California University of Pennsylvania encourages students to get the most out of their education with over 100 undergraduate programs, 95 graduate programs, and additional certificate programs that offer even more experiences to students earning undergraduate or master's degrees. The college's Four-Year Graduation Plan ensures undergraduate students feel supported and succeed with advising, counseling, and individual attention. Members of the U.S. military and their families interested in earning further degrees will find scholarships and discounts along with flexible education opportunities at this college. California University offers over 75 distance learning programs for students looking to earn online degrees in Pennsylvania. Adult learners seeking continuing education on-campus or online are also welcome, as are high school students and visiting undergraduate students from other universities who want to earn college credits. On-campus students can enjoy SAI Farm, a repurposed beef and dairy farm adjacent to campus that now hosts a garden, an environmental studies habitat, various recreation areas, and an open-air amphitheater. Pennsylvania State University's World Campus offers the same degrees and programs that an on-campus student attending Pennsylvania State University would have access to. Students can earn certificates, undergraduate and graduate degrees, or doctoral degrees, all through online self-study, peer interaction, and instruction from top professors. The World Campus Military Team works with active service members and veterans to incorporate individual educational goals with military responsibilities and benefits, and there are a range of scholarships and services available to students in the military and their spouses. Students who previously attended Pennsylvania State University, either on-campus or online, can easily apply their previous credits to a World Campus program. International students with English language proficiency are also welcome to enroll and earn an online degree in Pennsylvania through this program. The historic, 150-year-old Clarion University of Pennsylvania provides a range of over 100 degree programs for students to choose from as they pursue educational opportunities and careers in their ideal field. Students interested in studying areas of health can take advantage of Clarion's Pre-Professional Programs, which offer close advising with highly trained professionals in areas such as dentistry, veterinary medicine, and physical therapy. High school students can take courses for college and high school credit through a Dual Enrollment Program, which is part of Clarion's extensive online course offerings. The college has distance learning programs to suit any schedule, including seven-week online programs for five different majors that allow students to work more quickly through course material to earn a degree or certification through this online college in Pennsylvania. New students and adult learners alike can find the right program to earn their degree either on-campus or entirely online. Students at Mansfield University of Pennsylvania can choose from a wide range of undergraduate majors, but also may explore over 40 minors to fine-tune their educational experience. Mansfield offers graduate-level courses to students who are not pursuing a degree, but are interested in earning college credits, enriching themselves professionally or personally, or meeting Pennsylvania educator requirements. Five Pennsylvania high schools are involved in Mansfield's Dual Enrollment program, which allows students at these select high schools to take college courses that fulfill both high school and college course credits. Even students who are not at these five high schools can enjoy taking college courses at Mansfield through the college's College Bound program. Mansfield also offers online individual courses or full distance-learning academic programs to students who wish to attend an online college in Pennsylvania. The same courses are available to online students and on-campus students, and online students at Mansfield have access to the same library resources as well. Students who enroll at Indiana University of Pennsylvania and attend classes on-campus will find that this university works to support students' academic success in all aspects of their life. The on-campus housing options include suite-style dorms with study and resource rooms, and living-learning communities of peers who share similar academic, career, or personal goals and participate in academic and co-curricular programs together. Indiana University of Pennsylvania cultivates well-rounded students with their special programs, which range from ROTC to sustainability studies. The university's interdisciplinary education programs draw faculty from different departments to provide students in these programs with greater perspective. The college is also known for its culinary school. Students exploring online colleges in Pennsylvania will find fully online or hybrid undergraduate and graduate degree programs at Indiana University of Pennsylvania. The online program hosts hundreds of courses in over 50 areas of study if students want to complete general education or prerequisite courses online to save time and money. The four colleges, graduate studies program, and honors programs at Slippery Rock University of Pennsylvania set this school apart as an environment for academically-focused individuals. Undergraduate students can pursue research and gain experience in their fields through self-directed study. The Honors College offers many benefits to students interested in greater academic challenges, including spring trips and international education opportunities. On-campus students live in residence halls, apartments, living learning communities with peers who have common interests, or graduate student housing, which creates a greater sense of community. Students looking to earn online degrees in Pennsylvania can work to complete their undergraduate degree or undertake a master's or doctorate program through Slippery Rock's online learning programs, which offer the same learning tools and high-quality instruction that on-campus students receive. West Chester University of Pennsylvania knows the value of cultivating students' interests, whether they are finely focused or wide-ranging. Students have opportunities to pursue research at any stage of their academic career, in fields that are within their area of study or just within their areas of interest. U.S. military veterans and their spouses and dependents will find a wealth of resources available through the Greg and Sandra Weisenstein Veterans Center, from financial aid to ROTC information. Living on campus is a great way to experience the college community, and there are several different residence hall options, including shared suites or apartments. Students who wish to earn an online degree in Pennsylvania will find themselves supported every step of the way through West Chester's online master's, doctoral, and graduate certification programs. Some of West Chester's many degree programs and courses are only available online or through a blended format of classroom learning and online self-study, but students always have access to academic support, either over email or by phone. First-year students at Edinboro University of Pennsylvania are fully supported in their transition into college life and college academics through the First-Year Experience Program. At this university, there are five colleges, 22 departments, and over 100 fields of study that students can explore as they pursue their academic and career goals in business, education, science and health professions, the arts, humanities and social sciences, or graduate studies and research. Edinboro's Honors Program is available to students pursuing any major and gives preferential scheduling privileges, special housing options on Living-Learning Floors, extended library privileges, scholarships, and opportunities for both travel and mentoring. Edinboro also encourages students who are not seeking a degree but are interested in taking college courses can spend a year taking classes that interest them. For students seeking online degrees in Pennsylvania, Edinboro offers undergraduate and graduate programs as well as video conference courses that can be completed through distance learning. Both online and on-campus students can sign up for personal enrichment and professional development courses to expand their range of experiences. Lock Haven University has a historical mission of training Pennsylvania teachers, and while they continue to offer great programs for educators, they have vastly expanded the scope of their programs. Students can choose to pursue a degree from one of three colleges: natural, behavioral, and health sciences; liberal arts and education; or business, information systems, and human services. Undergraduate programs are broken up into majors, minors, concentrations, and dual majors, so undergraduates have opportunities to explore and develop their academic interests and demonstrate their commitment to future careers in their chosen field. For those interested in attending online colleges in Pennsylvania, Lock Haven has several graduate programs available in a completely online format, along with online trainings for people interested in taking classes without earning college credit. Many undergraduate courses are also available online. Beyond academics, Lock Haven's Global Honors Program supports scholars who are well-rounded and interested in developing their leadership skills. There also are opportunities to pursue hands-on research projects with peers and professors. Because Lock Haven has a small student body, it is possible for students to live on campus all four years in a residence hall, suites, or apartments. The East Stroudsburg University of Pennsylvania touts itself as a "university without walls", a phrase that emphasizes its sense of community. Located in eastern Pennsylvania, the university's small-town feel carries over into the school's atmosphere. However, nearby interstate access connects students to locations like Philadelphia or New York City in less than two hours. Here, students can choose from 55 undergrad or 22 master's programs, with one doctoral degree on the docket. East Stroudsburg is easily one of the best colleges in Pennsylvania for students who want options, from online to on-campus classes and outdoor activities ranging from canoeing, skiing or tubing to big-city travels. There are also 100 student-run organizations and 20 athletic programs in which to participate while earning a higher education from East Stroudsburg, a school with more than a century of history. At Pennsylvania College of Technology, students find hands-on learning leading to more than 100 degrees. The school boasts a 96 percent job placement rate after graduation with the “degrees that work.” Earn an associate degree, a bachelor's degree, or a variety of certifications in technology fields from one of the best technical colleges in Pennsylvania. The 17-student average class size ensures students receive the attention they deserve at Penn College, where part-time or full-time commitments are accepted. Nine degrees, for which an out-of-state discount may be applied, can be completed totally online, with others offered on campus in fields such as business, engineering, health sciences, and construction. Degree seekers at Penn College may benefit from a range of campus life perks, including child care, campus living, student activities and study abroad programs, to name a few. Discover the college in Williamsport, PA, about one hour south of the New York State border! Gratz College, founded more than a century ago, teaches Jewish studies and holds the record for oldest independent college in the field. Gratz was the first higher education Jewish institution to accept women as equal students to men. Ever evolving, the school offers on-campus, online and blended learning while earning bachelor's or master's degrees, PhD or EdD, along with multiple certifications. Explore the non-profit school's available courses to get a feel for the type of Jewish-centric education offered at one of the best Jewish colleges in Pennsylvania. Gratz College has received recognition and accreditation from or partnership with the Middle States Commission on Higher Education, the Ministry of Education and Culture of the State of Israel and the Jewish Federation of Greater Philadelphia. Financial aid may be available for U.S. and international students to attend the private college. Gratz College is located in Melrose Park, PA, which sits on the Philadelphia city line. Still have questions about how online learning works in Pennsylvania? Check out the frequently asked questions below to find answers. Do online credits cost more or less in Pennsylvania? Online credits typically cost the same or less than on-campus credits for Pennsylvania residents. Online programs can cost less than on-campus programs since they require fewer physical materials; however, the cost of online credits varies depending on the school and the program. In Pennsylvania, schools that charge more often provide additional student services, greater program choices, and superior faculties. Residency will impact costs as well. For out-of-state students, online credits often cost less than on-campus credits because many online universities in Pennsylvania charge a single flat rate, regardless of residency. While the average tuition in Pennsylvania costs more than the average tuition across the country, online students can still find affordable high-quality options in Pennsylvania that meet their budgets. Which Pennsylvania schools accept the most transfer credits? Many Pennsylvania schools offer accommodating transfer credit policies. Some Pennsylvania schools permit students to transfer in a maximum of 90 credits. These Pennsylvania schools, like Chatham University, typically only accept transfer credits from an accredited university that hold a grade of “C” or better. While almost all Pennsylvania schools welcome transfer students, most schools require transfer students complete a specific number of credits at the graduating institution. Pennsylvania State University, for example, requires students to complete 36 of their last 60 credits at the school. This requirement ensures graduates receive a Penn State education. Similarly, some schools, like the University of Pennsylvania, require students to complete at least half of the credits in their major at the institution. Some schools also offer transfer credits for work experience, military experience, or College Level Examination Programs. Will any online colleges in Pennsylvania accept a GED? Many online colleges in Pennsylvania accept students with a GED. Typically, schools require students to send in GED transcripts and high school transcripts for all completed classes. The school then reviews the applicant’s file and decides if the student meets the admission requirements. Schools may require additional documentation, like recommendation letters. At Penn State, the admissions office accepts standard applicants and adult learners with GEDs, permitted the student sends all high school transcripts as well. Students who do not meet traditional application requirements may receive acceptance as provisional students if they meet the institution’s provisional requirements. Some schools offer academic forgiveness for students with GEDs who provide acceptable reasoning for poor prior academic performance and/or conditional admissions to students who do not possess program prerequisites. How many academic terms per year do online colleges in Pennsylvania offer? Start dates for online programs in Pennsylvania depend on the program and school. Some online colleges in Pennsylvania offer monthly or near-monthly start dates, which allow students to start their education without waiting for a new semester. However, some online schools in Pennsylvania structure online programs like on-campus programs, meaning courses start every fall, winter, and summer. Typically, though, online colleges in Pennsylvania provide students with more start dates than on-campus programs. Since many online programs in Pennsylvania feature an asynchronous format, program calendars require less structure, which allows students to take courses at different times and in different orders. These programs feature eight-week sessions with start dates every 2-3 months. Some schools provide inter sessions as well, courses that start in the middle of fall or winter. Synchronous online programs feature less-frequent start dates because of schedule demands on faculty and students. Which online colleges in Pennsylvania will accept the FAFSA? In Pennsylvania, all online colleges accredited by the Middle States Commission on Higher Education (MSCHE) and approved by the state Department of Education accept the Free Application for Federal Student Aid (FAFSA). To check the status of a program, the Council for Higher Education Accreditation provides a search directory for institutions, programs, and accreditors. Even private licensed schools allow FAFSA, granted MSCHE accredited the institution and the Department of Education licensed it. In addition to FAFSA, accredited and approved Pennsylvania schools also provide access to the State Higher Education Grant Program. For eligibility, students must enroll in, at minimum, a two-year, 60-credit program with at least 1800 hours of instruction. While still eligible, students enrolled in distance education programs with more than 50% online instruction may receive reduced grant allowances. The Pennsylvania Higher Education Assistance Agency requires students to complete the state grant application and the FAFSA application to determine eligibility for the state grant. Are there any free online classes I can take from Pennsylvania colleges? Students will find most free online courses, including those from Pennsylvania colleges, in the form of Massive Open Online Courses (MOOCs). Many institutions across the country and the world contribute MOOCs to different online providers and hosts. These courses, in addition to providing cost-effective education for Pennsylvania students, also provide greater access to Pennsylvania programs for students from around the world. Coursera and edX, two of the most common MOOC hosts, offer courses from Pennsylvania State University and the University of Pennsylvania. In fact, PennX, the latter school’s MOOC site through edX, provides courses and certificates to students. While MOOCs may not provide credit toward a degree, students can use them as refreshers and supplemental learning. With minimal or no costs associated with the courses, students can take as many as their schedules allow. How can I find the online program options at Pennsylvania colleges? While students can find many online programs and courses on different Pennsylvania college websites, Pennsylvania’s State System of Higher Education provides one of the best resources available to students for searching through the available online programs. The search directory allows users to search through all online programs offered by the 14 member universities of the state system. With over 300 degrees and certificates available, the directory is a good place to start your search. The state system also provides resources for locating financial aid, finding the right program, and learning about faculties. Each student should fill out the FAFSA as their first step in applying for financial aid. Pell Grants provide a substantial portion of the higher learning population with funding. Students who are ineligible for federal funding should explore state-specific scholarships. The following scholarships are specific to those attending Pennsylvania schools. TFEC provides scholarships to students residing in various Pennsylvania counties. The organization offers more than 120 scholarships to Pennsylvania residents pursuing academic interests. Many of the scholarships require community involvement and residency in a specific Pennsylvania county. Funded by the Philadelphia Education Fund, this scholarship program is awarded to high school students from Philadelphia with a minimum GPA of 3.0. Applicants must plan to pursue a bachelor’s degree and apply to an accredited college in specific Pennsylvania counties. Awarded to students pursuing postsecondary degrees in Pennsylvania, the Maguire Foundation and Pennsylvania Society scholarship is presented to students demonstrating financial need, community leadership, and academic performance. Applicants must have a 3.0 GPA and take a minimum of nine credits in government, American history, and/or political science. The Horatio Alger State Scholarship awards future leaders across the country from each of the fifty states. Students applying for the Pennsylvania award must reside in Pennsylvania, demonstrate financial aid, and plan to enter college the same year they graduate high school. Applicants must maintain a 2.0 GPA, display community leadership and involvement, and show the ability to overcome adversity. The state grant program offers aid to eligible Pennsylvania students to help them fund their education. Funded primarily by the Commonwealth of Pennsylvania, the Pennsylvania Higher Education Assistance Agency provides funding to students based on financial need.